Hallandale Beach, FL (October 12, 2017) – Privé Jets, an award-winning private jet charter company, has launched a brand new 25, 50, 75 and 100 Hour Jet Card Program. For a limited time, Privé Jets is offering an introductory 10 Hour Jet Card to clients who would like to try their jet card program. The limited offer will allow clients to access light to heavy jet category aircraft for both one-way and round trips at the same value as Privé Jets' 25 Hour Jet Card. The pricing for each size category of aircraft is inclusive of fuel and taxes and is presented as a fixed hourly rate. The aircraft offered to cardholders are model year 2000 or newer and ARGUS/Wyvern certified. Eligible flight destinations include the 48 contiguous United States, Puerto Rico, Canada, and several Caribbean nations. 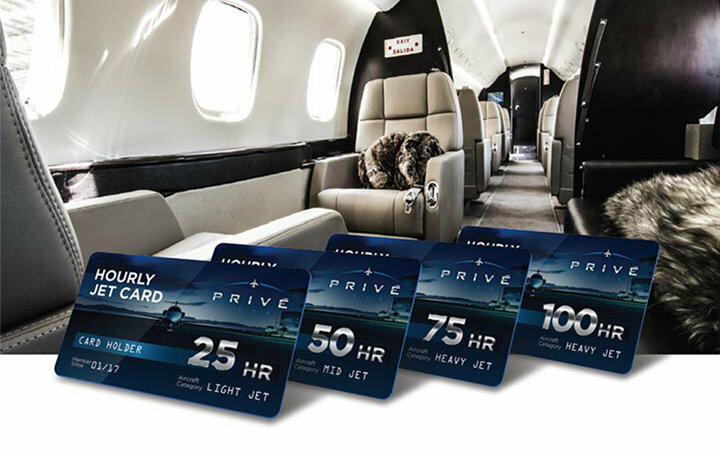 Having been in the private charter industry for over a decade, Privé Jets' continued dedication to offering value led to the development and redefinition of the 10 Hour Jet Card Program. Privé Jets relied on feedback from a diverse cross-section of its frequent flying clientele to design a card that truly complements the broad range of on-demand charter services the charter company currently offers. "Our hourly cards where designed to offer clients a considerable amount of value. Our cardholders benefit from having better control of their travel expenses and won’t have to guess at the total cost or worry about going over budget,” said Andres Arboleda, COO of Privé Jets. “We know that staying within budget is of major concern and in response, we have taken steps to design our card program to address that concern." The new hourly cards are the latest addition to a comprehensive array of private charter services that extends beyond aircraft. With one phone call, passengers can arrange ground transportation, in-flight catering, luxury hotel accommodations and even charter a yacht. For more information about Privé Jets and the jet card program benefits, visit www.privejets.com. Privé Jets is a leading provider of private aviation and private jet charters offering an enhanced experience in all aspects of luxury and corporate jet travel through the dedication and expertise of our highly trained professional travel consultants and affiliates throughout the world. Privé Jets is a Wyvern Broker, a proud Virtuoso Travel Network partner and a member of the National Business Aviation Association. Privé Jets offers clients access to more than 6,000 aircraft and 50,000 airports worldwide.